Ray’s Roofing Company is one of the most trusted names in Orange County when it comes to roofing, but maybe you didn’t know that we have a complete repair department with a 98% first attempt success rate. The key to our high success rate is our approach to solving a roof problem. A problem should be fixed not patched. A broken tile may not cause a noticeable leak, but it will eventually cause greater damage to your home if left un-repaired; i.e. drywall, wood rot, etc. We have a large stock of old and new roofing tiles to replace your broken or cracked tiles. 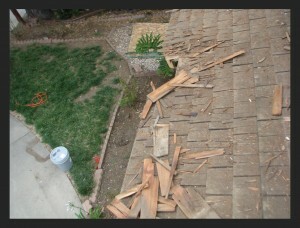 We replace damaged roofing felt or adjacent water damaged wood if necessary. We repair broken tiles caused by termite tenting, window washers, painters, cable or dish installers, and fallen tree limbs. Multiple leaks on tile roofs should have a tile relay. Tile relays are installed the same as a new roof system with the use of your existing tile, or can be substituted with a new tile. Ridge cap replacement, you may not need a new roof, just new ridge caps. Removal of unused penetrations through the roof. Repair new penetrations through the roof. It is important to use the correct materials when repairing or replacing a flat roof.